Our Feline friends prefer a much quieter environment than their canine counterparts, so we have dedicated a section of our resort entirely to them. 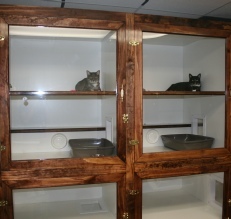 We also have the largest condos available to cats in our area. They have been specially designed by our owner. They are large enough to hold multiple cats and have the ability to expand to provide as much space as you would like for your cat to move around in. Our Kitty condos also have individual ventilation for each condo and our Kitty Condo room has a separate ventilation system from the rest of the building as well. Just another special touch to make your cats stay with us more comfortable. 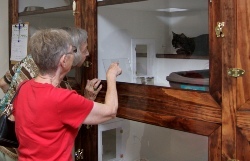 Cats that enjoy playing with people will have the opportunity to interact with our Pet Pals in the open play area or get some great lap time in our Granny Chair. We can accommodate different variations to our condos to ensure your cat is as comfortable as possible. You will have different options to choose from when you book your appointment. We recommend that you bring your own food to keep your pet on his/her regular diet. Your pet will already have a certain degree of stress from boarding (even though we have excellent accommodations), therefore, a change in diet can cause stomach trouble. Please pack your pet’s dry food in large zip lock bag because it is easier for us to store. Canned food is fine if that’s what your pet is used to. Any treats, toys or bedding that will make their stay more comfortable is welcome. 1 two-story Kitty Condo is $15.00 per night. 25% discount for 2nd cat in same condo. Discounts also offered for extended stays past 10 days. 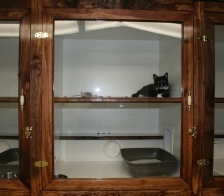 Our custom designed Kitty Condos are the largest most spacious and expandable Kitty Condos you will find anywhere!